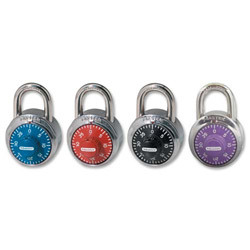 Combination padlock features a colored dial and combination security for keyless convenience. The locking mechanism has three-digit dialing and 1,500 combinations for maximum security. Padlock design has a 1-7/8" (48mm) wide, double-armored stainless steel body and hardened steel shackle for extra cut resistance. Assorted Padlocks and Cables from Master Lock Company! 70 In Stock today.